Explore New York City in a way you’re never likely to forget – up high in the sky on a doors off helicopter photo tour. It’s not every day that you get the opportunity to fly in a helicopter, let alone one with NO DOORS. This is the experience that awaits adventure seekers and photographers when you book a tour with FlyNYON. 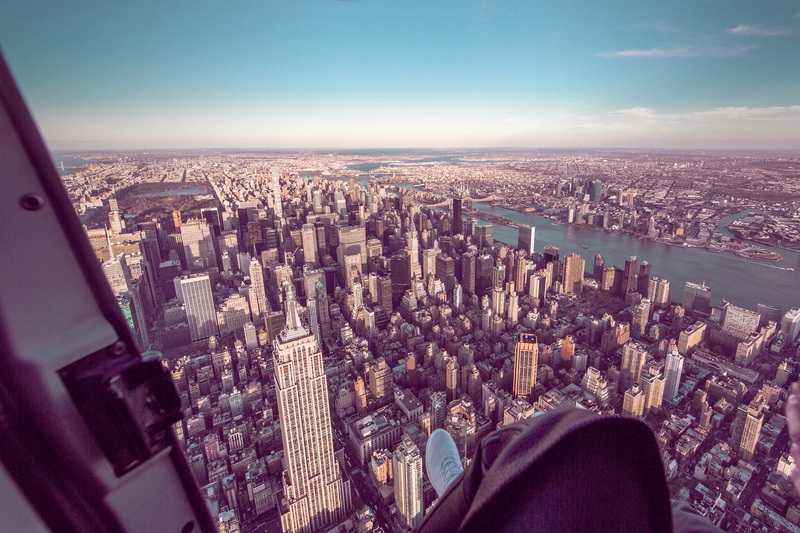 Don’t miss the magic of seeing New York City from above! 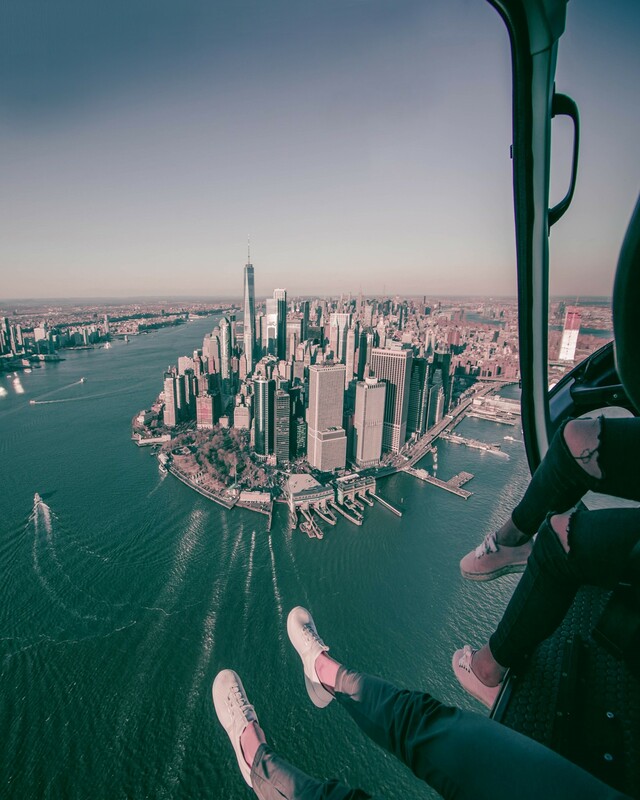 A helicopter flight with no doors is an exhilarating way to view New York City, to say the least. 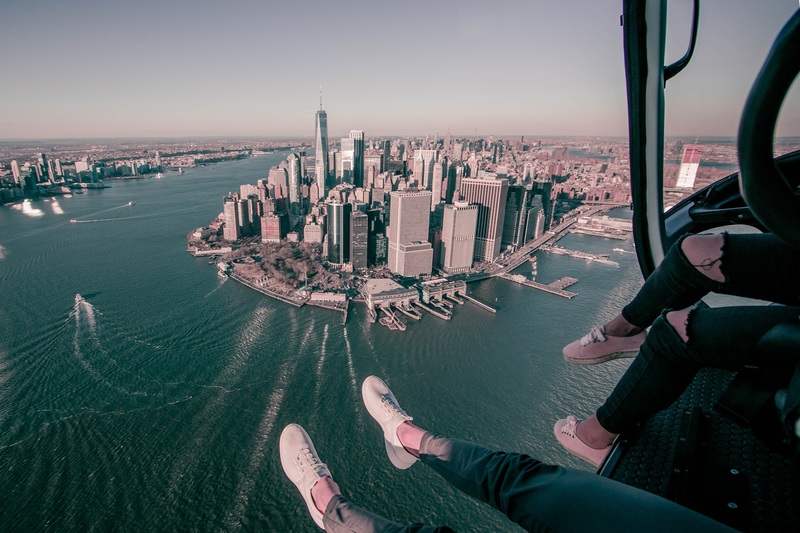 Your feet literally dangle out of the side of the helicopter as it flies over your favorite New York City sites. In other words, the best foot selfie opportunity you’ll ever get! With only 5 seats available per flight, the tour is 100% customized to what you and your copter-mates want to see. We chose to fly over some of the most popular sites, such as the Statue of Liberty, Central Park, Freedom Towers, the Empire State Building and more. You’ll be surprised what all you can see in just 30 minutes. Alternatively, there are 15-minute rides available which primarily cover lower Manhattan and the harbor area. My FlyNYON review: The sky’s the limit! With open door access, there is no obstruction between you and the subject matter. Whether you bring an iphone or DSLR, you’ll have the opportunity to challenge your aerial photography skills. Make sure your camera equipment has a strap, because all gear must be securely attached to your harness. It gets very windy at 1,500 feet in the air, so be prepared to use your steadiest hand ever. Nevertheless, the helicopter ride is a magnificent feast for the eyes. Within minutes after take-off, you’re soaring above the city lights, iconic buildings, landmarks, cars and people. A feeling that can only be described as invincible. 1. As I mentioned before, it is extremely windy and cold during the flight. I recommend wearing a face mask and warm, comfortable clothes. Girls, tie your hair back! 2. Make sure your shoes fit snug! This is a doors off helicopter experience, so let your feet dangle for a mandatory #footselfie. 3. Choose your seat wisely. For the best experience possible, I suggest taking the front seat next to the pilot as the windshield will block you from the intense wind. 4. First time flyers/aerial photographers should stick to a midday or morning flight when there is plenty light to snap those insta-worthy photographs. It isn’t as easy as it looks, but it is 100% fun (and 100% windy)! 5. The team at FlyNYON recommend a maximum of two camera devices per person. Lenses cannot be switched in flight so make sure you plan accordingly. 6. HAVE FUN! 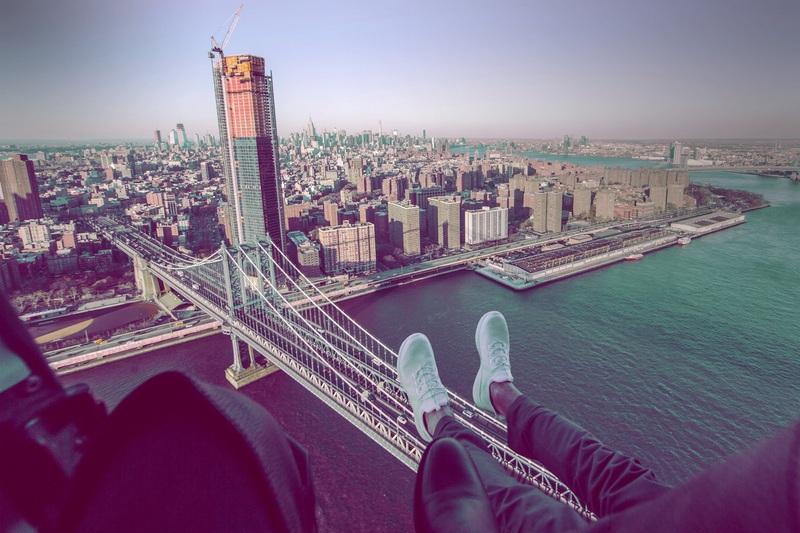 Don’t miss out on enjoying the experience and unique perspective of NYC because you were too preoccupied with getting that perfect shot. 7. If you are deathly afraid of heights, try starting with the NYON intro flight which is a 10-minute, doors-on excursion. Planning a trip to New York City? Read about my experience staying at the sparkling Baccarat Hotel in Manhattan. This is a sponsored post on behalf of FlyNYON, but the opinions expressed in this article are, as always, my own. What a great review – thank you! Quick question, I only have a Samsung S9 phone and no “professional camera”. Do you think this will be sufficient? I am no pro photographer either but I am obsessed with sunsets and adrenaline so figured if the shoe fits then why not! Also, do you think because I am a rookie I shouldn’t do sunset as I read your comment above? Thank you.